You have a secret identity (or two or three) why shouldn't your computer accessories have them as well? Take this common device. It looks like an ordinary flash drive, and you can use it as one. But in addition to the usual digital storage, its ordinary exterior conceals something unexpected. 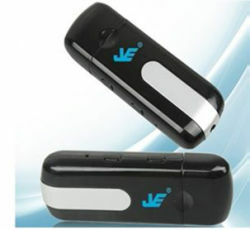 It is also a DVR that records both audio and color video. It doesn't have to be plugged into a PC to record lectures or to watch your office with just a single touch, with its motion activated mode you don't even need to be there to start it! The flash drive needs no cables or batteries, making perfect for the covert operative on the go. The support for up to 32GB Micro SD cards allows you to capture hours of footage in its memory. This ultra sophisticated device takes multitasking to the next level.